Words are powerful. The perfectly timed phrase or expression can carry more meaning and accomplish more than just about anything else. From the pulpit they carry even greater value because they are so connected with the Word of the Lord. At their best words can be used in a fruitful way, demonstrating the kind of building-up that the bible often refers to, in order than we can affirm one another in love. At their worst, words can be used in a destructive way, hurting those around us, and ignoring the truth of God’s role in the world. On January 30th, 1933, Adolf Hitler became the democratically elected chancellor of Germany. This was the beginning of the Third Reich. Germany, the land that had produced the likes of Bach, Goethe, Durer was now being led by a man who consorted with criminals and was often seen carrying around a dog whip in public. Hitler was known for using his words in public propaganda for destructive purposes. Some of you here this morning can remember how the world shuddered when this began to take place. Two days after Hitler was elected, a twenty-six year old theologian name Dietrich Bonhoeffer gave a radio address throughout the German nation. The speech was titled “The Younger Generation’s Altered Concept of Leadership.” Though the talk was itself highly philosophical, it constructively argued against the type of leadership that Hitler would use for the next twelve years, inevitably leading a nation and half the world into a nightmare of violence and misery. Before Bonhoeffer could finish, the speech was cut off. Only two days after Hitler’s election, the Nazis were suppressing this young man who spoke out against the type of leadership that would come to define Germany over the coming decade. What we find in the first chapter of Jeremiah is an encounter between the human and the divine. We discover how powerful words can be through God’s call. As the divine Word, God is a genuine and invisible otherness when compared to Jeremiah. During this particular encounter the word of the Lord came to Jeremiah and the prophet meets in faith the God who meets him through the Word. In his Word, God does not deliver a course of lectures on dogmatic theology, He does not submit the content of a creed of a confession of faith, and he does not even produce a perfectly prepared three-point sermon. Instead He makes himself accessible to us. An exchange takes place here in scripture that is beyond any analogy in the sphere of rational thinking. Instead, we have here a simple encounter, just like one between any two people, where God makes Himself available and known through relationship. Jeremiah’s experience guides him into boundary, toward his own finitude, being reminded of his humanity, as over and against God. Jeremiah’s encounter is a reminder for us that we are not God. God is wholly other when compared with his creation. When Jeremiah meets God, his personality sinks away into the background; he feels his words being replaced by the Word of God. When we truly encounter the depth and beauty of the triune God, everything about us begins to sink away as well. It is no wonder therefore why Jeremiah evades the commission of God. “Surely you can’t use me God, for I am only a boy.” Jeremiah protests because he is overwhelmed and intimidated by the call to set aside priests, princes, and people to become a prophet to the nations. He was afraid to proclaim the Word of God, which would go beyond the comprehension of his time. Recoiling from a divine appointment is common throughout scripture. It only takes a moment to remember Moses standing in the heat of the burning bush and then turning his face away because he was afraid to look at God. The theologian Paul Tillich once said: “we always desire to escape God… People of all kinds, prophets and reformers, saints and atheists, believers and unbelievers, have the same experience.” It is safe to say that a person who has never tried to flee God has never experienced the truth of who God is. God dismisses Jeremiah’s excuse; Young or old, learned or uninformed, handsome or ugly, none of things matter to God because they all pertain to our own self-centeredness: my powers, my status, my desire to have reality on my terms. Because of the power in God’s Word Jeremiah does not react in silence, nor does he step aside to let someone else take his place, instead he steps into the situation, which has in a way stepped into him. He responds to the encounter of God, feels the Word of the Lord placed on his lips, and is prepared to do God’s work. From this point forward Jeremiah will not go forth on his own terms; God will send him, and he will move according to God’s will. It is because of God working in and through Jeremiah that he will be able to speak and act in the specific situations as they arise. The encounter has changed Jeremiah so that he will be able to narrate God’s plucking up and planting again. Jeremiah will speak the truth of the Word of God regardless of whether or not they are agreeable to his youth, ambitions, moods, or self-examination. It is only when it is made plainly clear to Jeremiah that the point at issue has nothing to do with his own abilities or the extent of his talents that the truth of God’s reign is made abundant and it becomes possible for Jeremiah to become a messenger. Like Jeremiah, the young German theologian Dietrich Bonhoeffer felt the call of God to proclaim the Word. Things became very difficult for Bonhoeffer after he made that first radio address. As the German nation descended into Fuhrer worship with the German church emphasizing politics more than theology, he struggled with how to be authentic to the Word of God as a pastor and a theologian. He trained young pastors through an underground seminary at Finkenwalde and preached about remaining faithful and obedient to God before anything else. 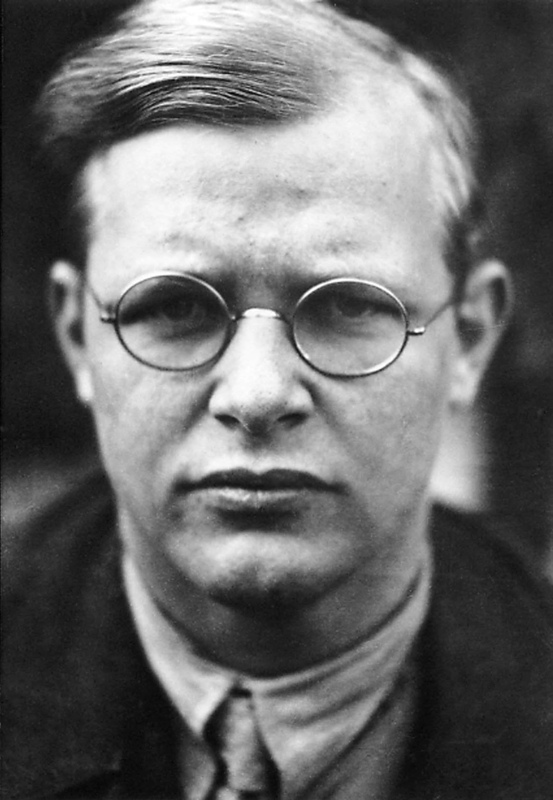 As it became harder and harder for him to proclaim the good news in Germany, Bonhoeffer learned that war imminent and was frightened about being conscripted into the army. Bonhoeffer was a committed pacifist and was adamantly opposed to the Nazi regime, therefore he would never swear an oath to Hitler nor fight in his army. However, to refuse this would be a capital offense. 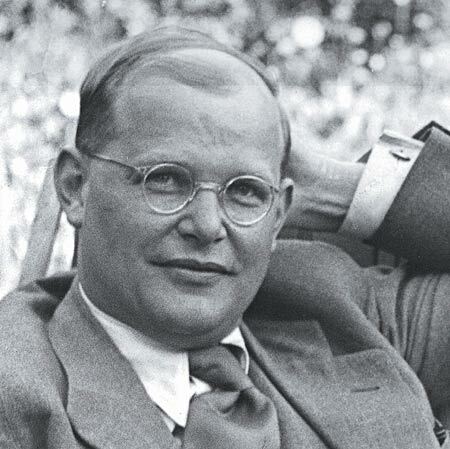 It was at this time that Bonhoeffer accepted a position at Union Theological Seminary in New York. While in the United States Bonhoeffer had somewhat of a Jeremiah experience, because even though he had the freedom to run away from his calling in Germany, Bonhoeffer realized that his responsibility was to God with the German people. Just as God would pluck up and replant the Israelites in Jeremiah’s time, Bonhoeffer knew that the German nation would have to be destroyed in order for it to be fruitful once again. And so Bonhoeffer returned to Germany on the last scheduled steamer to cross the Atlantic before the war. 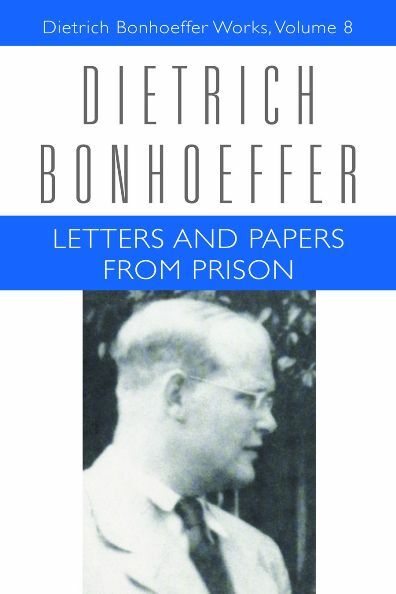 Upon arriving back in Germany, Bonhoeffer’s desire to speak powerful words against the Third Reich resulted in him being forbidden to speak publically starting in 1940 and he had to regularly report his activities to the police. Within a year he was forbidden to print or publish. And on April 5th, 1943, ten years after making his radio address, Bonhoeffer was arrested by the Gestapo for his continual Anti-Nazi remarks and involvement with the Abwehr’s plot to undermine Hitler’s regime. He remained in prison for two years, able to write letters and theology that were smuggled out by sympathetic guards. I fear that whenever we hear stories of people like Jeremiah or Bonhoeffer we regard them as a special kind of people, set apart for the work God ordained for them. And to be quite honest, it is very unlikely that anyone of us in this room will ever be imprisoned, or suffer, for our Christian identity. But we are all called to be Jeremiahs and Bonhoeffers in our commitment to following Jesus Christ. Just like those two prophets God has formed us, consecrated us, and placed the Word on our lips. There is a power in words that we regularly underestimate. The way that we often talk about other behind their backs carries with it a great destructive energy. When we ignore the truth of our interconnected as the body of Christ in this place by speaking poorly of one another does a disservice to the God who formed you from the womb. Our words are powerful, use them wisely. So too, there is a power in the words that we use to affirm and address one another in love; By caring for and reaching out to those around us we continue to live out the kind of fruitful lives that God has always envisioned for us. This church is called to be a place where we understand the power of our Words and use them appropriately. Do not be afraid of this power that God has given to you. Jeremiah and Bonhoeffer did not go in their own strength and neither do you. They did not speak on their own authority and neither do you. God is our strength and our authority. “I am with you to deliver you, says the Lord.” The thoughts of our selfish lives can be cast away to the side so that we can assume the proper posture as messengers of God. As Paul wrote to the Galatians “Yet not I, but Christ working in me” (Gal. 2.20). Throughout their lives both Jeremiah and Bonhoeffer saw the collision of powers in the world. What defined them was their ability to see God’s decisive acts in history, remembering that God is the true authority over all things in spite of the powers that dominated their cultures. Jeremiah and Bonhoeffer were ordinary people. They were just like us. They were living their lives, expecting everything to be fine when God put something on their lips to say. Hearing and responding to the Word of God is a difficult thing, but God is always speaking and our response to that Word will define us as a people of faith, hope, and love. Do not be afraid to speak the truth, for the Lord is with you. Bethge, Eberhard. Dietrich Bonhoeffer: A Biography (Fortress Press, 2000), 927. He sat silently in his office staring at the phone. Minutes passed and the moonlight continued to spill across his desk until he mustered up the courage to dial the number. The man was well respected in the community, owned the local hardware store, and he was a good Christian who regularly attended the local Methodist church. For years he had listened to pastors preach from the bible, he had helped as an usher for longer than he could remember, and felt that he was fulfilling his Christian obligations. That was until 6th months previous when the preacher talked about baptism from the pulpit. Now the man had heard this sermon before: “Baptism is our way of being incorporated in the body of Christ, into the church. We baptize in the name of the Father and the Son and the Holy Spirit because Jesus commanded us to.” He had heard the message time and time again and frankly he didn’t see the point, if he was doing everything else the bible said he needed to, why should he get baptized? For whatever reason he could not stop thinking about that sermon in the coming days, weeks, and months. His mind began to wander at work and at church. He neglected his obligations to perform usher duties and eventually he stopped attending church all together. The pastor had known for years that the man was not baptized, and had made a point to bring it up with him after Sunday services when they would shake hands. This went on for sometime until he eventually gave up. So when he received a phone call late one night with the man’s fervent breath on the other end of the phone, baptism was the furthest thing from his mind. So he gathered his belongings and rushed to the hardware store. 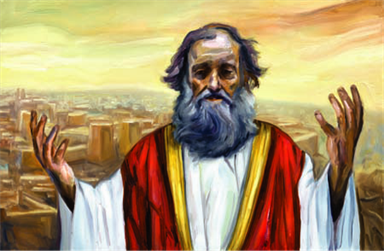 “The beginning of the good news of Jesus Christ, the Son of God.” So begins the gospel according to St. Mark. This particular gospel is unique because it is short, direct, and unreserved in its descriptions of the life of Jesus Christ. When we discover Jesus in Mark’s gospel we are getting the real deal, nothing watered down, just straight up good news. Of the four, it’s my favorite. I love how Jesus confronts his disciples, and us, throughout the pages with their inability to recognize who he is. They witnesses miracles, healing, teachings, and divine interventions yet they continually stumble while trying to follow their Lord. So here we are at the beginning. Mark begins by announcing that this is the beginning of the good news in order to remind the reader that, like the book of Genesis (which also means beginning), God is about to start something new. Just like God calmed the chaos in the first moments of creation, God will definitively change the world through coming in the form of Jesus Christ. John the Baptizer, the camel hair-wearing cousin of Jesus, is out in the wilderness preaching about a baptism of repentance for the forgiveness of sins. People from all over the place start going out to him, from the Judean countryside and even some Jerusalemites. 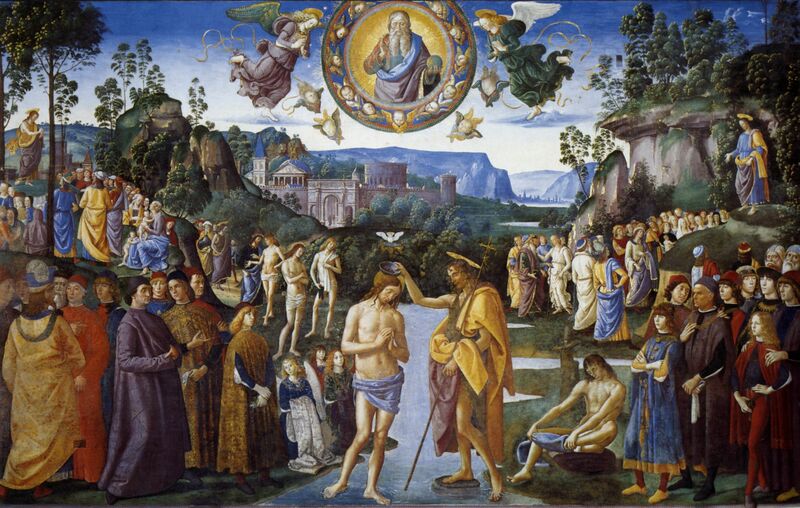 They all gather at the edge of the river Jordan and are baptized by John confessing their sins. Mark even gives us the details about John’s outfit and eating habits; at first it might seem like insignificant details, or facts that just add to the craziness of this man in the wilderness, but this is important. John is clothed in the attire of a prophet, different from everyone else. And here he is as a prophet calling the nation of Israel to repentance through a symbolic cleansing. Why does baptism matter? This is a question often flung around in churches and denominational disputes. If we do all of the things that the bible asks of us, why do we need to be cleansed by the waters of baptism? 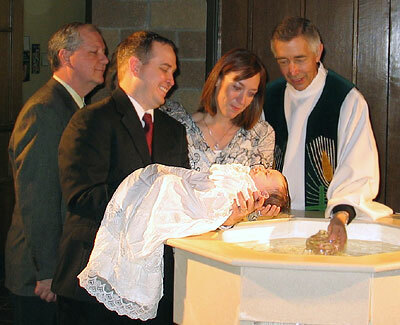 Why do we need to baptize babies? Have they truly sinned when they are only weeks old? Why would an unbaptized participating Christian need to participate in this sacrament? Baptism matters because we are who God says we are. When we examine the beauty of Jesus’ baptism as recorded in the gospel of Mark we get a glimpse of what God does with each one of us when we’re baptized: The Holy Spirit, a new creation, we are named. Before the baptism even takes place John announces what Jesus will do: He will baptize you with the Holy Spirit. Within Jesus’ life the Spirit is present in abundance: The Spirit descends on Jesus at his baptism (1.9) and drives him into the wilderness to be tempted (1.12). Jesus casts our demons by the power of the Holy Spirit (3.22) and promises his disciples that the Holy Spirit will tell them what to say when they are brought to trial (13.11). We are baptized with the same Spirit that abided with Jesus throughout his life. And immediately coming up from the water, he saw the heavens ripped apart. In other translations it says “he saw the heaven parting” (NKJV) or “he saw heaven open up” (New Life Version) but the Greek says: εἶδεν σχιζομένους τοὺς οὐρανοὺς literally, “he saw the heavens being ripped apart.” The use of the word σχιζομένους is particularly important considering the imagery that is attached with it. The word appears only one other time in the entirety of Mark: it is used to describe the Temple curtain being ripped apart at the moment Jesus died on the cross. In both circumstances what had been long sealed is suddenly flung open. This is the signal of a new creation, whatever was has been changed for good. God has ripped apart the heavens to declare Jesus as “the Beloved.” Every time we baptize, whenever someone is in Jesus Christ, there is a new creation. In might seem paradoxical, but, in no Gospel is the humanity of Jesus more apparent, nor his divine authority more striking. In this one moment in Mark 1 all three members of the Godhead, Father, Son, and Holy Spirit are present with one another affirming both Jesus’ divinity and humanity. God names Jesus in the baptism; his identity is forever sealed. For us today, the baptism of believers also establishes our identities. Jesus is who God says he is. So also we are who God says we are; in Christ Jesus we are the sons and daughters of God as Paul writes in the letter to the Galatians: “for as many of you as were baptized into Christ have put on Christ” (Gal 3.26). Last year, 40% of United Methodist Churches did not have a new profession of faith. Nearly half of our churches did not welcome a new person into the beauty of what it means to be the body of Christ. This number is perhaps higher than we might anticipate because many of us were baptized as children and only become true disciples/members later in life in confirmation or a personal profession of faith. But when we encounter the truth of God’s holy Word in Mark 1 we are to be held accountable to our own baptisms. What we have here, this church, the Word of God, the sacraments, the relationships, they are worth sharing with the world. They are greater than any treasure on earth because they sustain, they nurture, and they are eternal. The text of Jesus’ baptism meets us where we are and allows us to encounter the Lord in the emptiness of our own lives. We get to hear the voice of a rough yet incredible prophet named John who calls all of us to turn around and accept the greater baptism of a risen Lord. It encourages us to experience Christ in a powerful and personal way. It gives us the space to start again and find newness in our lives. Most of the time that we think about baptism we picture the perfect family standing at the front of the church with their baby in white, a clumsy pastor trying to hold the child and say all of the right words, and smiles and happiness throughout the congregation. God exists neither next to us nor merely above us, but rather with us, by us and, most important of all, for us. He is our God not only as Lord but also as father, brother, friend; this relationship is seen so clearly in Jesus’ baptism, and every time someone is incorporated through water into the body of Christ. What a great God we have, the one who created the heavens and the earth, entered into covenant with his servant Abraham, wrestled Jacob on the banks of the Jabbok, called Moses from the burning bush, delivered his people Israel from captivity, sustained the nation through the judges and prophets, anointed the kings to lead his people, became incarnate in Jesus Christ, saved the world by dying on a cross, and was resurrected three days later. Why does baptism matter? It matters because we are who God says we are: his children. Hear the word of the Lord, you rulers of Sodom! Listen to the teaching of our God, you people of Gomorrah! What to me is the multitude of your sacrifices? says the Lord; I have had enough of burnt offerings of rams and the fat of fed beasts; I do not delight in the blood of bulls, or of lambs, or of goats. When you come to appear before me, who asked this from your hand? Trample my courts no more; bringing offerings is futile; incense is an abomination to me. New moon and Sabbath calling of convocation – I cannot endure solemn assemblies with iniquity. Your new moons and your appointed festivals my soul hates; they have become a burden to me, I am weary of bearing them. When you stretch out your hands, I will hide my eyes from you; even though you make many prayers, I will not listen; your hands are full of blood. Wash yourselves make yourselves clean; remove the evil of your doings from before my eyes; cease to do evil, learn to do good; seek justice, rescue the oppressed, defend the orphan, plead for the widow. Come now, let us argue it out, says the Lord: though your sins are like scarlet, they shall be like snow; though they are red like crimson, they shall become like wool. If you are willing and obedient, you shall eat the good of the land; but if you refuse and rebel, you shall be devoured by the sword; for the mouth of the Lord has spoken. When I was in college I tried to attend as many different worship experiences as I could. At times I gathered with high church Presbyterians, Free Church Pentecostals, non-denominational evangelicals, and southern Baptists. After having already begun to wrestle with a call to ministry, and knowing that I was a Methodist through and through, I thought it would be helpful to experience many forms of Christian liturgical worship, and discover the individual strengths and weaknesses. There was one campus Christian organization that met every a week in one of the lecture halls at JMU in order to have their worship service. Now this group was one of the most talked about throughout the university and people always raved about the spirit, vigor, and excitement of the services. A few of my friends from the Religion department regularly attended, so one week I decided to give it a shot. Let me tell you: those people knew how to worship. If you can imagine a full band: drum kit, 3 guitarists, bass, keyboard, and multiple singers. 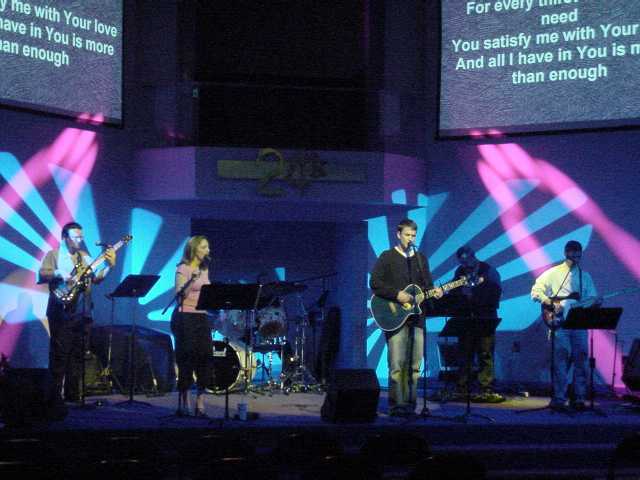 They had stage lighting set up that would change dramatically during the songs, and even during the sermon. They had giant projectors that displayed lyrics, prayers, and even sermonic notes. When the band was playing, everyone had their hands in the air praising. When the preacher was praying, everyone had their heads bowed in submission. It was an experience. The energy in the room was so palpable that I felt on fire for Jesus when I left. About a week later, after spending way too many hours in the library, I found myself walking back across the quad late at night toward my locked up bicycle. Across the perfectly mowed grass I saw a young man stumbling and trying desperately to maintain his balance. As our paths inevitably drove us closer and closer I recognized him from the worship service I had been in the week before, this young inebriated college student was the bass player for the worship band. It was obvious that he needed help, and remembering that I was a Christian and thinking that this would be a Christian thing to do, I offered him my arm and began to walk him back to his dorm. Worship is important. As Christians we have gathered together for the last 20 centuries first in synagogues, then basements and homes, eventually we started to build churches, and then cathedrals. Worship is at the heart of what it means to be Christian because we participate in the kind of life that Jesus led with his disciples in the 1st century. You might not realize it, but the basic pattern of our worship service has its roots in the ancient practices of the Israelites, and have been handed down to Christians ever since. First we gather together: we are brought into this place as a community, the body of Christ. We assemble together from the outside world preparing ourselves to be launched into the realm and praise of God almighty. Second we proclaim the Word of God. We read from the scriptures of the Old and New Testaments. We remember the mighty acts of God in the world as recorded in the Bible and then a sermon is given in order to let the Word become incarnate in our hearing and living. Third we respond to the proclaimed Word. After hearing about and remembering God’s actions in our lives and the lives of others we return to God with our own participation. Sometimes this response takes place in the form of Communion where we recommit ourselves and are welcomed to God’s table. Other weeks we respond with affirmations of our beliefs such as the Apostles’ Creed. Finally, we conclude by being sent forth. We re-enter the world bringing with us the light of Christ. As a gathered community we recommit ourselves to life outside of the church being the body of Christ for the world. Here’s the frightening part: All of that is meaningless unless our lives are transformed. One of the things that we definitively learn from scripture, particularly the Old Testament is this: the children of God, the objects of divine grace, are not in any way worthy of it. Time and time again in the scriptures we learn about the people of Israel who, by way of their faithlessness, were transgressors of the commandments given to them by almighty God. Just think of some of the so-called “heroes” of the Old Testament: Noah – saved his family and all the animals in his ark and then got drunk and cursed one of his sons for all eternity. Abraham – entered into the holy covenant with God and then pretended to be his wife’s brother and nearly murdered his son. David– delivered the Israelites from the Philistines by killing Goliath, and then stole Bathsheba from her husband and tried to have him murdered. I could go on and on. The normal sermonic response to these stories of failure and sin is that the children of God are corrupted children. However, in time, God came to dwell among his people and came in the form of a baby named Jesus, the one Israelite who took the place of the disobedient children, the faithless people, and their faithless priests and kings. The Word made flesh. It is only in the light of who Jesus is and was that we see how far humanity had fallen from the grace of God. What we miss though is the fact that this type of behavior, this faithlessness, does not only apply to the Israelites and the people of Isaiah’s critique, but in fact acts as a mirror for all of us. Its very easy to read this passage from Isaiah and assume that the Israelites were the one’s who got it wrong, but us enlightened folk in the 21st century, we United Methodists, we’ve got our worship lives together, we are appropriately liturgical. But the Word of God has a most perturbing way of disregarding dates and making truth contemporary. Isaiah begins, “Hear the word of the Lord, you rulers of Sodom! Listen to the teaching of our God, you people of Gomorrah!” He continues by pointing out all of the failures of their worship: “What to me is the multitude of your sacrifices? I have had enough burnt offerings!” It’s as if God were looking at us today and saying: “I don’t care about your opening Hymn, I have heard enough of the scriptures read aloud.” All these elements of worship, the types of things we take for granted every week are relatively meaningless to God unless what we do in this place translates into the way we live our lives. 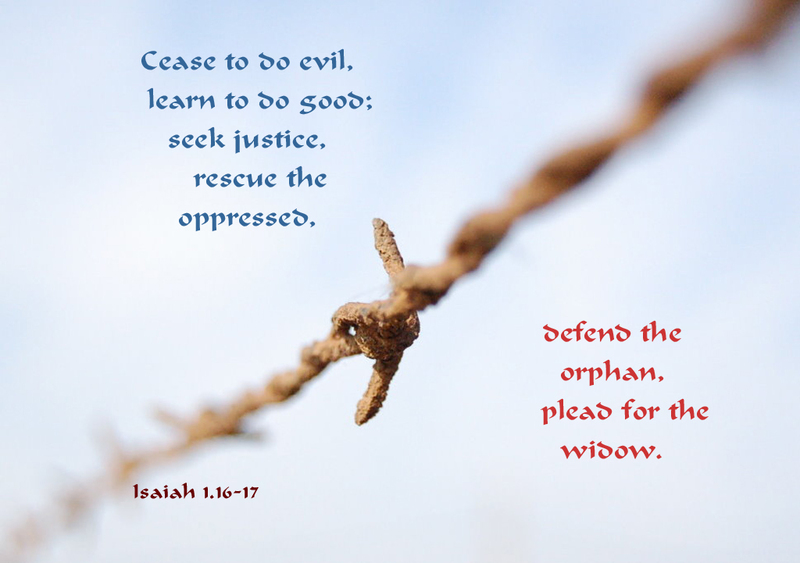 “Wash yourselves, make yourselves clean, remove the evil of your doings from before my eyes; cease to do evil, learn to do good, seek justice, rescue the oppressed, defend the orphan, plead for the widow.” These are the things that are important to God. The Hebrew prophets Isaiah, Amos, Micah, Hosea, and Jeremiah each denounce worship practices that have no influence on the way we handle our lives. The prophets try again and again to demonstrate that God is far more concerned with the relationships between people than with the details of public worship. “Wash yourselves, make yourselves clean.” It is precisely at this moment that the voice of God, through the prophet Isaiah reaches us across the centuries and bids us to look into our own hearts before we come to God. Sometimes we don’t like to admit it, but there is a relationship between corporate worship and individual character. What we believe shapes how we behave. When I ran into the young man on campus, the bass player for the worship service, I got a glimpse into what Isaiah is getting at in this passage. You can have the “perfect” worship service, we could get the lights going with the projectors and the band and the PowerPoint and the over the ear microphones. We could get people to wave their hands in the air and sing at the top of their lungs. But, worship ceases to be true worship unless our lives are changed when we re-enter the world. Worship becomes just a routine for us if we treat it like that bass player did: just a gig. We here, good Christian United Methodists, we might not be guilty of the same hypocrisy in our worship, but we need to face the truth that to raise no voice against the evils and injustices of the world, to remain silent in the shadow of corruption and sin, is to leave a fatal gap between the type of Worship we offer to a righteous God, and the attitudes we have toward the wrongs of the world. Throughout history there has been a deep inconsistency between the faith we proclaim on Sunday mornings in the fatherhood, justice, and holiness of God and the type of ethics and moral decisions to which we consent in our lives and particularly in our dealings with other people. We should ask ourselves: Is our worship changing the way we live our lives? Are we heeding the call to love the oppressed? Are we content to remain almost Christians, or are we fully embodying what it means to be disciples of Jesus Christ? Why do we gather together once a week? All of this, gathering, proclaiming, responding, being sent forth, remains empty until we are transformed. They will continue to act only as a routine for us unless we enter the strange new world of the Bible and realize that our world has been turned upside down. We gather weekly to turn ourselves back toward God so that we can live lives that follow the teachings and practices of God in Jesus Christ. What we do in this place can function to help transform our lives if we continue to learn the grammar of discipleship and speak that new language when we go back into the world. The only true worship worthy of God, the worship that God seeks from his people, is the time and space that reveals God’s character through justice, righteousness, unselfishness, and purity. What we are must ratify what we say. Or as one of my professors used to say: We can only live in a world we can see, and we can only see in a world we have been taught to speak. When we learn the stories of scripture, let the tunes and words of the hymns resonate deeply in our lives, we can then learn to be a new people for the world. It is the responsibility of this church to make the love of God known and to comfort all people with the Good News of our Lord Jesus Christ. This cannot be done through worship alone, through singing hymns alone, through preaching alone, or by any other institutional method we can come up with, but only through living lives which reflect God’s loving spirit. When you walk out of church this morning I encourage you to remember that God has already transformed you through the life and death of Jesus Christ. As you interact with others remember that we have been called to love the oppressed, and seek justice in the world. I challenge you to do something this week that is truly worthy of God’s worship. Worship in God’s church takes place right here in this space, but the results of our worship should be manifest in the way we live our lives here and in the world. Amen. 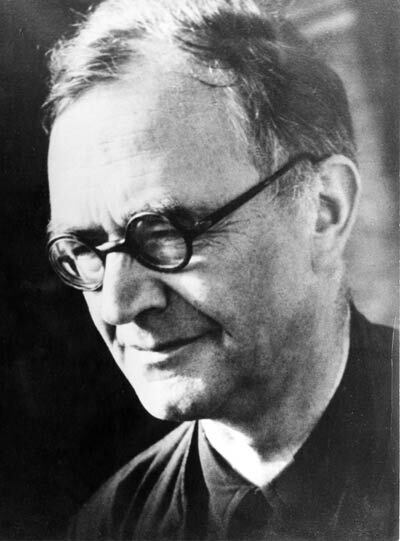 Barth, Karl. Church Dogmatics V.1. (Peabody, Mass. : Hendrickson Publishing, 2004), 523. Someone in the crowd said to him, “Teacher, tell my brother to divide the family inheritance with me.” But he said to him, “Friend, who set me to be a judge or arbitrator over you?” And he said to them, “Take care! Be on your guard against all kinds of greed; for one’s life does not consist in the abundance of possessions.” Then he told a parable: “The land of a rich man produced abundantly. And he thought to himself, ‘What should I do, for I have no place to store my crops?’ Then he said, ‘I will do this: I will pull down my barns and build larger ones, and there I will store all my grain and my goods. And I will say to my soul, Soul, you have ample goods laid up for many years; relax, eat, drink, be merry.’ But God said to him, ‘You fool! This very night your life is being demanded of you. And the things you have prepared, whose will they be?’ So it is with those who store up treasures for themselves but are not rich toward God. It was late. I had been working for Duke University Hospital for some time and I was used to getting the random alerts on my pager. They always seemed to come in waves, or at moments when you were busy with something else. It had been a trying shift already, quite a few deaths, arguments in the lobby, too many prayers to count before surgeries… I remember looking at my watch after receiving the page, reluctantly putting on my white lab coat, and heading to the room number. You never know what to expect on the other side of a patient’s door. Sometimes it was a family celebrating good news, or a patient wanting to complain about the hospital food, or sometimes death was waiting on the other side. On that particular night I entered the room and saw two brothers on opposite sides, ignoring one another, with their no longer living mother under blankets on the hospital bed. She had died from complications following surgery, and like any death at the hospital; I was called to offer my services to the family. I introduced myself, and expressed my condolences to both men, but they refused to stand together or even acknowledge one another’s presence. So I stood there just inside the doorway, moving my body to the left and to the right attempting to convey my deepest sympathies for their recent loss, and give them the space to experience what had occurred. After prolonged periods of awkward silence I invited the men to join me in an adjacent room so that we could meet with Decedent Care in order to fill out the necessary paperwork regarding their mother’s body. They filled out the appropriate forms, revealed which funeral home would be receiving the body, and I got my things together to leave when the real discussion started. “Where have you been?” one said to the other, “I’ve been with mom for months, watching her die, taking care of her… if you think I’m going to let you have any of the inheritance you are sorely mistaken.” “Don’t you dare speak to me that way!” he replied, “I was her son too, I deserve my share. I know she never loved me like she loved you, but you better believe I’m going to do whatever it takes to get my money.” And he stormed out of the room. Seconds passed before the remaining brother sighed, collected his paperwork, walked our of the room and left the hospital. So there I sat, all alone, after having witnessed two brothers fight about assumed inheritance while their mother lay dead in the next room. The ugly fight and dispute in that hospital room is all too familiar: Arguing about inheritance. We see this kind of thing on TV, read about it in books, or have experienced it in our own lives: haggling over the furniture, dishes, paintings, property, and savings accounts. Most of the time this is done without a thought or consideration about the life that was lost, and the depth of one’s selfishness and greed shines frighteningly brighter than ever before. In Luke 12 a crowd gathered by the thousands was pushing in to hear anything they could from Jesus. Jesus triumphantly exhorts the people to confess fearlessly before God because the Holy Spirit will teach them what to say. While standing before the throngs of people Jesus is interrupted by a man and asked to judge an inheritance dispute. “Teacher,” the man says, “tell my brother to divide the family inheritance with me.” Jesus knows that he is not such a judge and he does not want to be. According to the words and actions of Jesus, these kind of specific ethical questions that judges deal with are not the ultimately important ones. When brought this vexing situation Jesus refuses to be a referee between the brothers; after all, who can judge whose greed is right? Upon first inspection, it seems as if the farmer has done nothing wrong. This is not some easily identifiable caricature of human desire but a truism that we can all identify with. For all intents and purposes he is careful and conservative. He is not unjust in the way that a typical parable would make him out to be. He has done what any rational and forward thinking person would do. He invests. He takes his extra surplus and puts it away so that he might reap from it for years and years. So, if he is not unjust, then what is he? Jesus tells us very directly: He is a fool! This farmer lives completely for himself, he plans for himself, he congratulates himself, and he even speaks to himself. He is a fool because his perspective can only go as far as himself. He is a fool because he is defined by nothing short of greed. He is a fool because God is nowhere in his story. The craving desire to hoard his possessions demonstrates how the farmer foolishly believes that he can do all things without God, that he will be fine without God. The farmer’s selfishness indicates the way is life is oriented: completely and totally inward. Jesus uses this short parable to challenge an accepted set of values: he is denying that it is possible to have security by amassing wealth and property. Instead he proclaims that one becomes secure only by being rich toward God and others. In the story the famer’s desire to hoard his goods not only ignores the role of God in his life, but is also an act of total disregard for the needs of others. What might appear as “good business” for the farmer actually has far reaching consequences for others in his community. It’s not explicit in the story, but the man is so focused on himself that he has ignored others around him who could also greatly benefit from his surplus. What good is a banquet of food if you are the only one in attendance? Jesus looks out at the crowd and through this story sets forth a new perspective on what it means to be in the kingdom of God. We cannot find security through an accumulation of abundance, at least not in the way the farmer believed. There is however, an abundance we do have; it is through Father, Son, and Holy Spirit that we can be in all things more than the farmer, it is only in the abundance of the mercy of God that we can be confident that neither death, nor life, nor angels, nor rulers, nor things present, nor things to come, nor powers, nor height, nor depth, nor anything else in all creation will ever be able to separate us from the love of God in Christ Jesus our Lord. To know this love in our hearts, souls, minds, and bodies, is to be rich toward God. We are to be disciples of Jesus Christ, intent on doing the will of God in the world so that his kingdom can reign abundantly, so that God can continually reconcile us to himself, to one another, and to his creation, so that we can be the body of Christ for the world redeemed by his blood. For the first time in my life, I am tithing to the church. To be honest, this is the first time I’ve ever earned a salary and had the capacity to give back to God a tenth of what I am earning. Everyday I have been in Staunton God has continued to show me that this is exactly where I’m supposed to be, doing exactly what I’m supposed to do. This is a gift; to be here as the pastor of St. John’s is a gift. We are to be a people of gifts. This means that we are called to give back to the good God who first gave to us. This doesn’t have to just come in the form of money because we are called to give to God through our gifts, our time, and our service. For me, I give part of my salary to God as a discipline, so that I can remember from whom all of this comes from first. How often have I been guilty of the same thoughts as the farmer? I did this, I’ve earned this, I deserve this. When in fact I have done very little for this graceful life. I owe everything to the people around me, and to the God who gave me the greatest gift of Jesus Christ. We are to be a people of gifts willing to offer ourselves to one another. Karl Barth once wrote, “When I really give anyone my time, I thereby give him the last and most personal thing that I have to give at all, namely myself.” How beautiful it is to offer ourselves to those around us, to those in need, and to those who need to feel the love of God through us. Giving ourselves to other people is beautiful because it is exactly what God did for us through the gift of his Son Jesus Christ. God came among us, to spend time with us, just as he does every day, to give us the most precious gift in the world: himself. Before us this morning the table has been prepared. Like our call to share ourselves with others, God desires to share this meal with us. We are invited to receive these gifts without any merit on our part but because God loves us. God has not kept his grace stored up in a barn for eternity, but out of God’s abundant love it has been presented to us in the death of his only begotten Son and the gifts of bread and wine. Who are we to be? We are to be disciples of Jesus Christ, willing to share with others the gifts that God has given to each one of us. We can give back to the good God who first gave us life through our tithes and offering, we can give back by serving those in need, we can give back by sharing the love of God with others, we can give back by offering prayers for our enemies. We are not called to keep the riches of our lives kept away for our own selfish enjoyment; instead we are called to be a people who are rich toward God. Amen.